French: Fast Track Learning from English Proverbs: The 100 Most Used English Proverbs with 600 Phrase Examples. Focus your French learning on the most frequently used English proverbs. Learn how to express in French the meaning of the 100 English proverbs you need for everyday life. Actually, to communicate, you only need to use the 100 most used English proverbs. These idioms are the most frequently used and can be defined using an algorithm that provides the ranking. In this audiobook, you'll find the list. 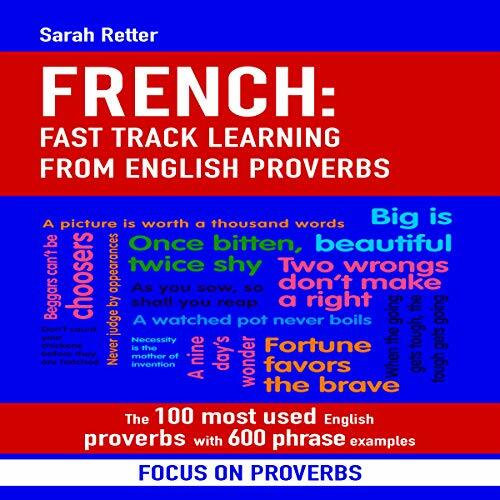 This audiobook will provide you with the 100 English proverbs you have to use first to get around when traveling or interacting with French-speaking people. So don’t waste your time and energy! Focus your effort on the most important English proverbs you have to understand to master French!